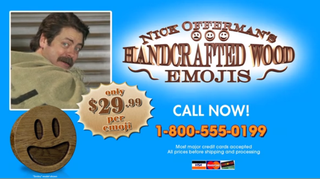 Nick Offerman is taking over the lucrative hand-carved wood emoji business in a big way. "You may know me from the hit show Parks and Recreation," says Offerman in his "informercial," courtesy of Conan. "And your spouse knows me from his or her sexual fantasies." Offerman's video pleads with us to get back to a "more old fashioned" and "more American" way of communicating with each other. Sounds great! To do that, Offerman is offering a line of solid wood, handcrafted emojis. This is a truly brilliant idea. "Communicating with my solid wood emojis is just like using regular emojis, but much, much harder, "Offerman explains. Messages you can share with Offerman's emojis include "I love you and I love cats," "I love you but I'm sad that the cat pooped" and many other heartfelt ways to express your love. OK, sign me up.